Frankly my dear, “don’t call me sugar” and a step back to 1866 accurately describe an amazing day of adventure for the Picky Peaches. Your perception of this blog will be GONE WITH THE WIND by the time you finish reading it because this week’s blog takes a very interesting turn towards the end. You’ll need a full mug of coffee for this one. The Picky Peaches had more fun than they’d anticipated at the Gone With the Wind Museum, well, fiddle-dee-dee, Scarlett on the Square, in downtown Marietta, Georgia. Housed in a former cotton warehouse and carriage stable built around 1875, the museum contains an impressive collection of novel and film-related memorabilia. The exposed brick walls, rough-hewn beams and wood floors are the perfect backdrop for the vintage books, scripts, costumes and other items. 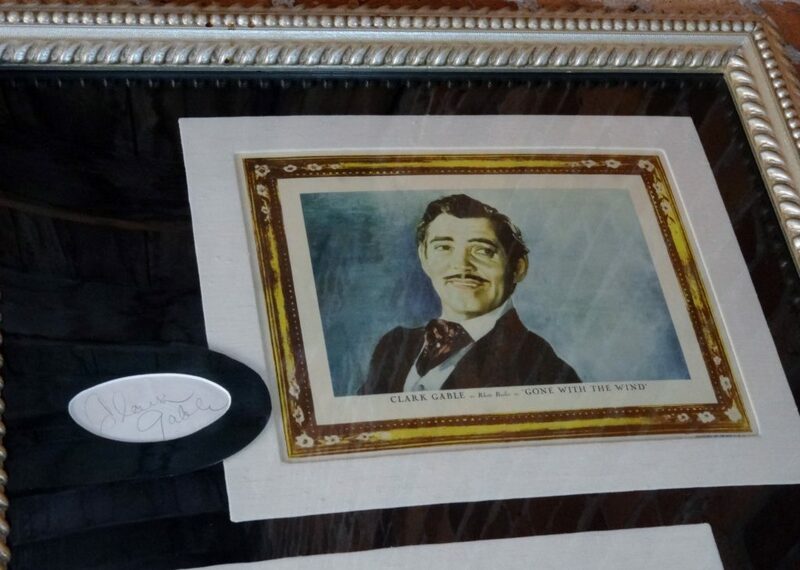 You may be a big fan of Gone With the Wind but, Dr. Christopher Sullivan of Akron, Ohio must be the ultimate GWTW fan because just about every item on display in the museum is part of his privately-owned collection. This collection includes items related to Margaret Mitchell’s classic novel as well as many items related to production of the film. There’s even a section devoted to the film’s Atlanta premiere. The museum isn’t very large, but it packs a lot of interesting items into the space. Plan on spending an hour or two. 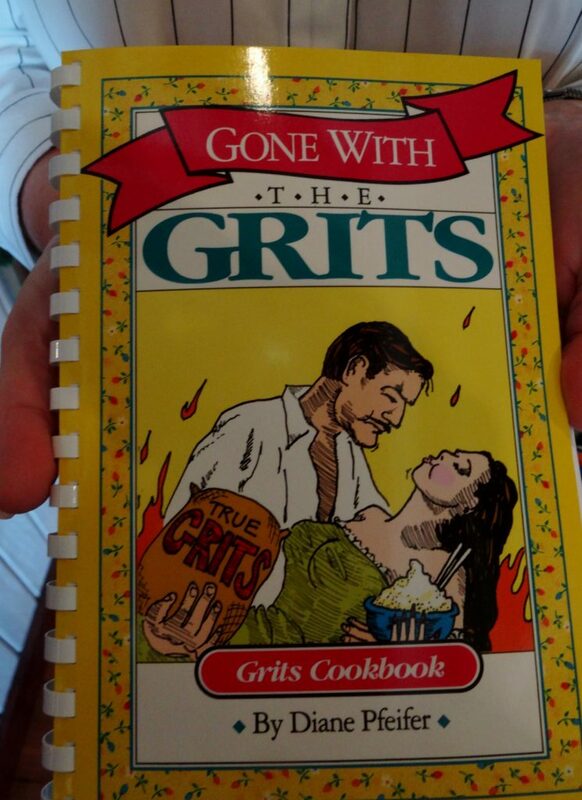 The gift shop has a variety of GWTW collectibles, Southern cookbooks and souvenirs. Park in the municipal parking lot near Starbucks. From there, it’s just a short walk across the railroad tracks. Do not park in the Starbucks lot. We’ve heard from reliable sources that they will boot your car. Museum hours: Monday – Saturday 10 a.m. – 5 p.m.
Tickets: Adults $7, Seniors (60+) $6. Our next stop in Marietta surprised all of us, and there’s no way to just tell you where we went and describe it for you, like we would normally do. We just have to tell you what happened, so refill your coffee and read on. When the Peaches were planning their trip to Marietta, Susan felt like we needed to do something in addition to the GWTW Museum. Two days before our trip, Susan was visiting a friend who mentioned she’d taken some books to Goodwill but discovered one book had fallen out of the box in her closet. Seeing that it was called Day Trips From Atlanta, she immediately thought of the Picky Peaches and gave it to Susan. When Susan got home she started perusing the book for ideas in Marietta. As she was scanning down the list of sites on or near the Square, Old Zion Baptist Church Heritage Museum jumped off the page. The book said the church was founded by freed slaves in 1866. Stop right there. 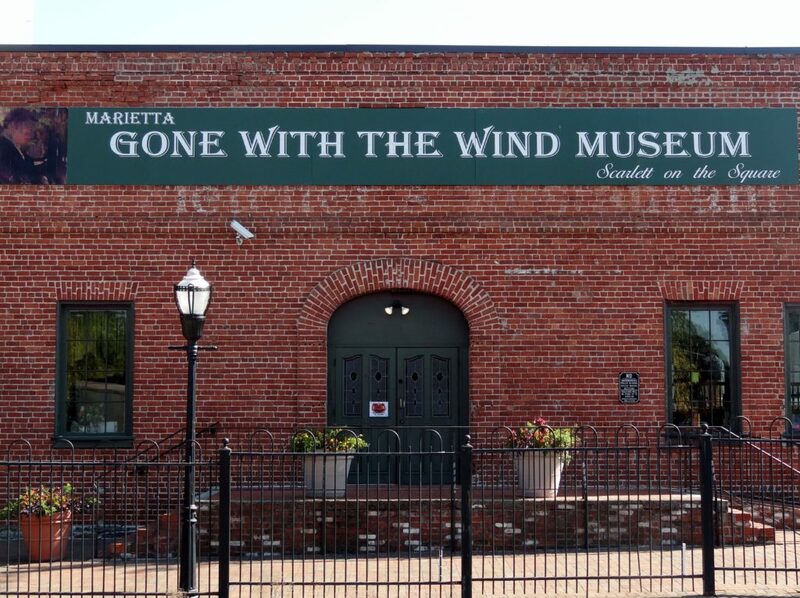 Yes, we’re aware that it may seem odd that we visited the GWTW Museum, which promotes a book and movie which have been controversial in their portrayal of slavery for many years, and the Old Zion Heritage Museum, which was founded by freed slaves, on the same day. We get that, but please continue reading. 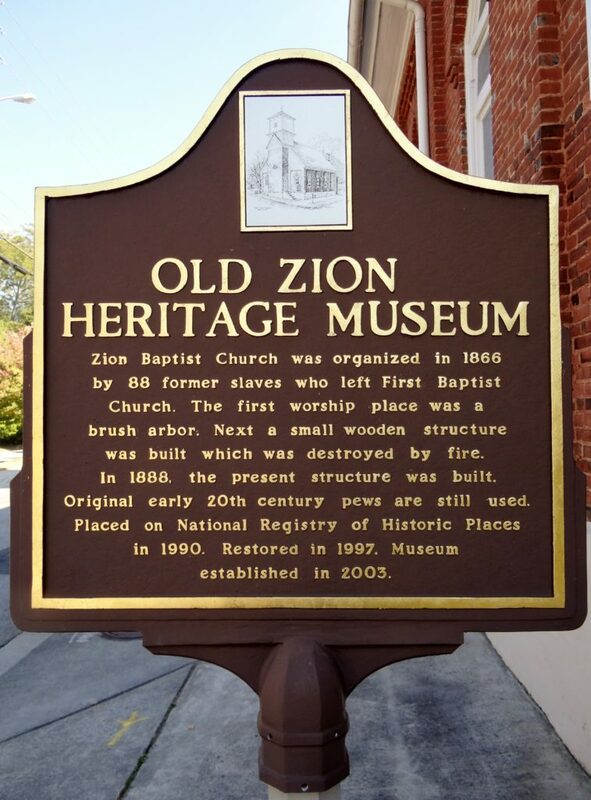 The Old Zion Heritage Museum is dedicated to the preservation of black history, art and culture. According to Susan’s new book, “tours are available on Thursdays and Saturdays 11 a.m. – 4 p.m. or by appointment.” So after our scrumptious lunch at the Red Eyed Mule and our visit to the GWTW Museum, we arrived to find lay leader, Mr. Louis Walker, unlocking the church for a choir rehearsal and NOT for tours. He was rather incredulous that we were there to “tour” the church and even asked if we had an appointment. 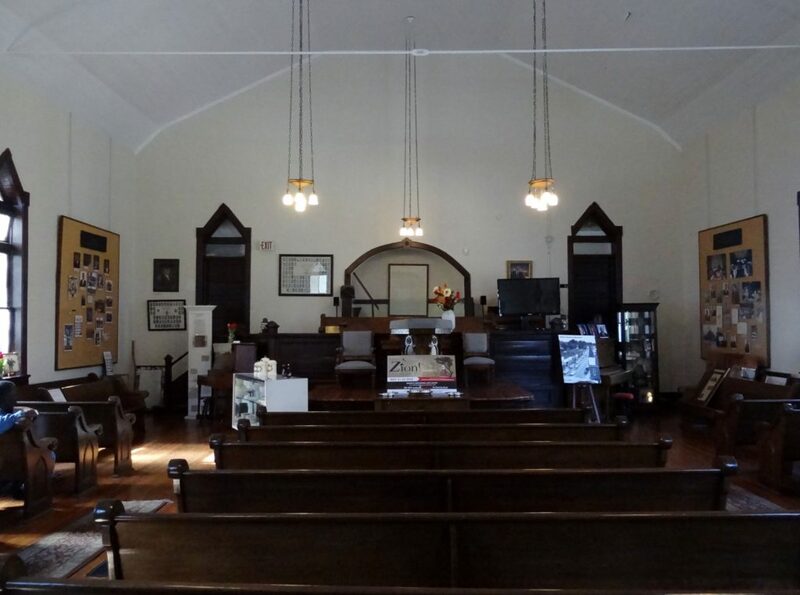 We noticed the sign at the entrance indicated that the museum’s hours are “Thursday 10:00 a.m. – 2:00 p.m. and by appointment.” After hearing who we were and why we were there, he invited us into the sanctuary to take a seat and shared some of the history of the church. While this elderly gentleman was talking, choir members started arriving, the pianist, Dr. Oral Moses, started playing hymns and the next thing we know, we were caught up in the music. Susan recalls stopping Mr. Walker to say, “I need to sing.” Seriously. In that moment, their voices, our voices and the piano became one harmonious sound. As the small choir “circled up” to pray and sing, they invited us into their circle. We were happier than kids in a candy store to join hands to sing “There’s Just Something About That Name” and “Oh, How I Love Jesus” with these folks. Truly, God showed up at Old Zion Baptist Church. The three of us do sing in a choir and we’ve sung in front of thousands of people but, that day there was only an audience of One. We were supposed to be there to worship with these beautiful souls. There were no words spoken. Just hymns sung to honor and worship our mutual God and Savior. There was no race. We were people worshiping together. It was beautiful. As we left, our hearts were full and our eyes filled with tears. It felt like we’d been given a special gift. We have no idea why the Picky Peaches were blessed in such a special and spiritual way to be there on a day the church wouldn’t normally be open. In the midst of all the political turmoil, we were overwhelmed by our reception, the worship and unity that came through our mutual belief in Jesus Christ. We’ll never forget it. It was a God Story and I think we all know it because we had the privilege of watching God unfold this little appointment before our very eyes. On this day, we were reminded we are not in charge. Oh, and another thing, we weren’t supposed to be at Old Zion at that time either. We’d been delayed by about 30 minutes because we’d had trouble finding parking spaces near the Square earlier that day and we’d had another delay of 10 minutes or so in the Starbucks parking lot. So the next time you face a delay, especially during the busy holiday season, keep your eyes open for something special that you’d have missed if you hadn’t been delayed. The Old Zion Heritage Museum is truly worth a visit, but we can’t promise that your visit will resemble ours in any way. 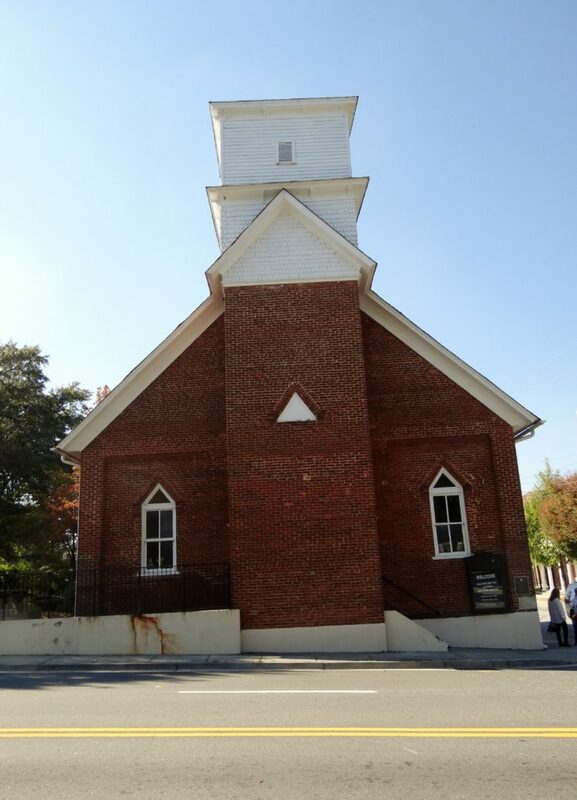 We can tell you that the church has a fascinating history and its courageous founders had previously worshipped at Marietta’s First Baptist Church. There are display cases with items from the church’s history, community accomplishments and vintage personal items. A play depicting the church’s founding, ZION! The Musical!, is performed annually and will be presented in late spring. Join us next week for two yummy brunch recipes worthy of your holiday guests. ← HIDDEN GEM RESTAURANT CHALLENGE #2 RED EYED MULE IN MARIETTA, GA: Grab Some Napkins and Go to the Red Eyed Mule! My dad used to stand outside the window as a lad and listen to the church services. Definitely a special place. Phyllis, it was truly a special moment when hearts were joined in worship! Your dad was a lucky man! Thanks for reading our blog! Thanks for reading! You can check out our lunch menu at the RED EDYED MULE on our blog posted 11/19/16 Titled “Grab Some Napkins and Head to the Red Eyed Mule”. They are known for their Sloppy Slaw Burger on Texas Toast!. It’s a messy culinary delight! Read our blog and salivate! Love and Peaches! 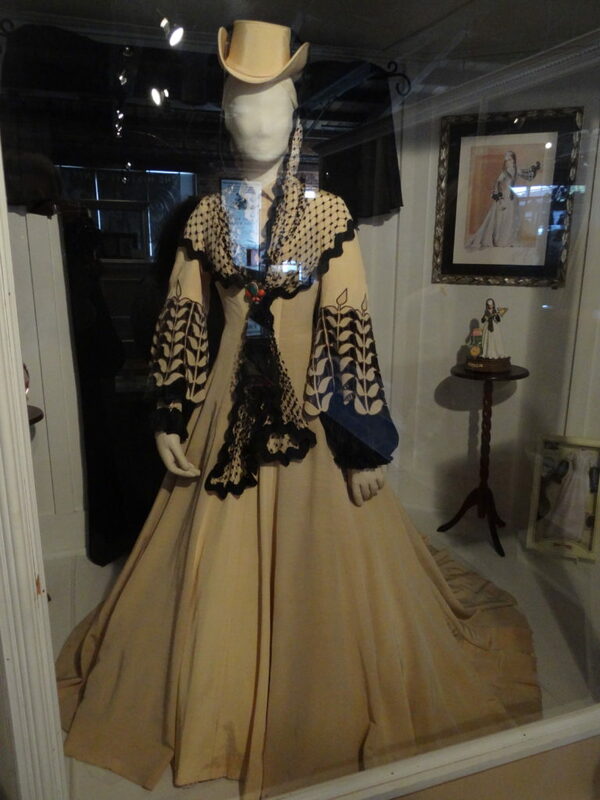 What a fun trip through the GWTW days of splendor and imagination! Thank you again, my sweet PP friends, for another fun time seeing your travels through your eyes and words! Love you all! 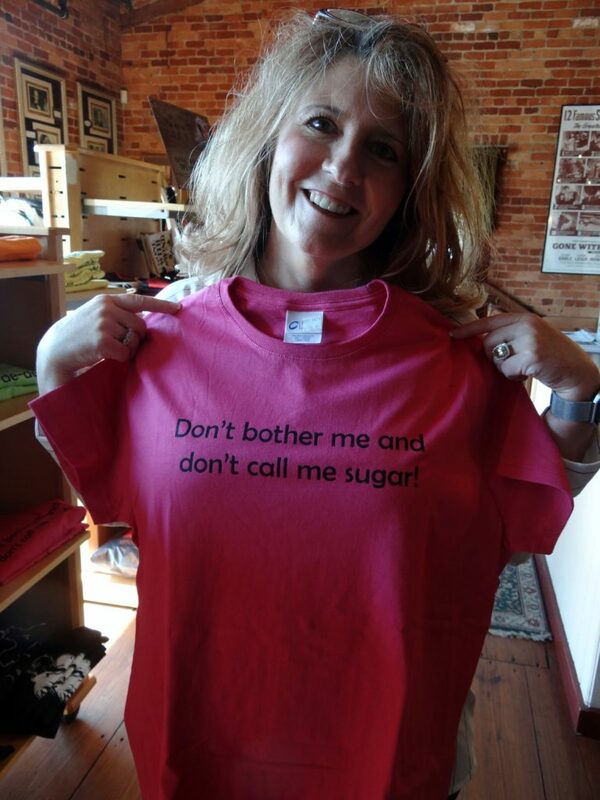 Our day on the Marietta Square was fun, awe inspiring and filled with surprises, like our blog! Thanks for reading and following the Picky Peaches! “Oh, How I Love Jesus!” Could have listened to that clip a dozen times and never grown tired of hearing it! What an amazing day for you wonderful ladies! Aren’t we glad God is color blind and was, is, and forever more will be in charge! Thanks for sharing such an incredible adventure! Mt. Zion was truly a special time of worship! Thank you for reading our blog! Just wanna input that you have a very nice web site, I enjoy the design it really stands out. Thank you Jody! Hope you continue reading Picky Peaches! As director of the Marietta Gone With the Wind Museum, Scarlett on the Square, I must share with all of you that Louis Walker and his wife Josetta are friends of mine. They have visited our museum (I gave them a personal tour) and Louis returned the favor at the Zion Church Museum (even allowing me to ring the bell). The Walkers and I have worked together on numerous projects and I adore them more than words can say. I so wish I could have joined the Peaches for their impromptu old-time singing at Zion. There’s no place like it and I dare say Margaret Mitchell would have loved it as well. Thanks so much for visiting ladies — you are always welcome anytime! Connie, thank you so much for your lovely comment! We truly had a special day in Marietta! A day we will not long forget.